New Braunfels Eis - AoM: Beer et al. The beer had a sour smell. Matching the nose, it had a sour test. However, there was also an odd, possibly chocolate taste. 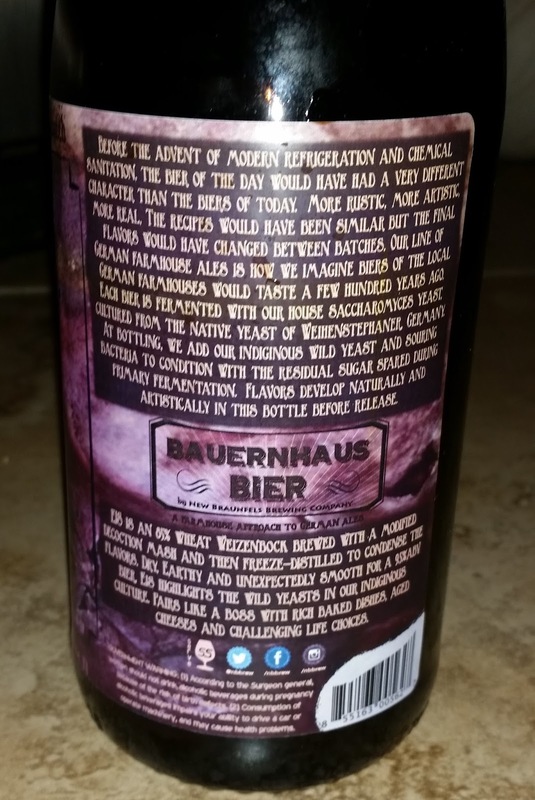 alcohol by volume 9.5 international bitter units 27 finishing gravity ? Before the advent of modern refrigeration and chemical sanitation the bier of the day would have had a very different character than the beers of today. More rustic, more artistic, more real. The recipes would have been similar, but the final flavors would have changed between batches. Our line of German farmhouse ales is how we imagine biers of the local German farmhouses would taste a few hundred years ago. Each bier is fermented with our house saccharomyces yeast cultured from the native yeast of Weihenstephaner, Germany. At bottling, we add our indiginous [sic] wild yeast and souring bacteria to condition with the residual sugar spared during primary fermentation. Flavors develop naturally and artistically in this bottle before release. 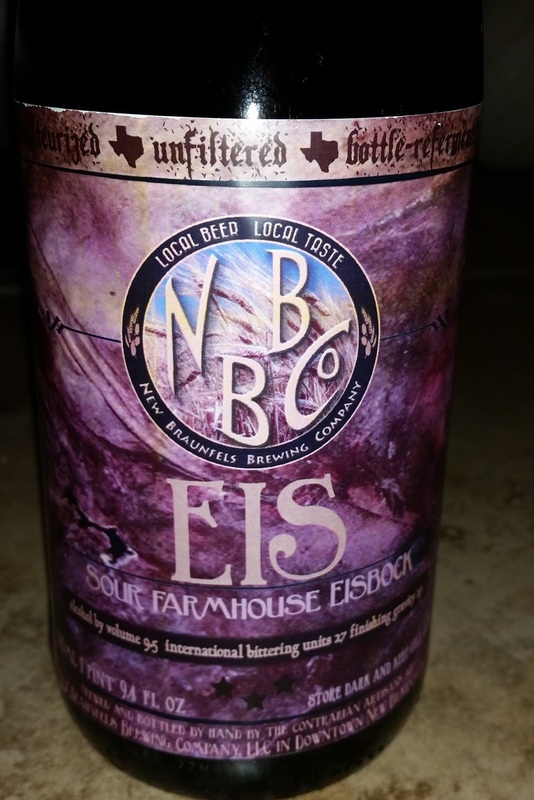 Eis is an 85% wheat weizenbock brewed with a modified decoction mash and then freeze-distilled to condense the flavors. Dry, earthy and unexpectedly smooth for a 9.5% ABV bier. Eis highlights the wild yeasts in our indiginous [sic] culture. Pairs like a boss with rich baked dishes, aged cheeses and challenging life choices.